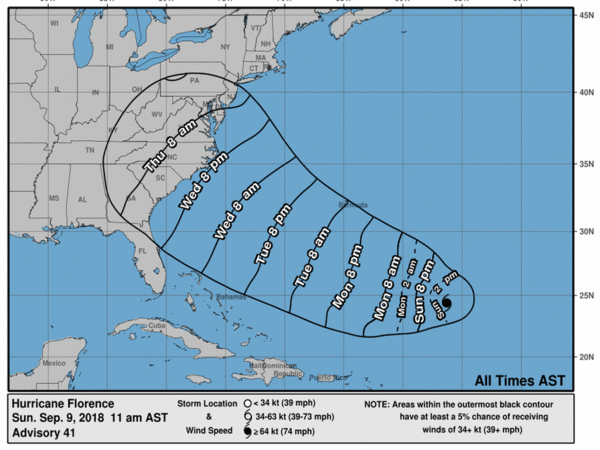 Florence, expected to approach arrive at the U.S. East Coast late this week, has just been named a Hurricane. Hurricane Olivia, headed towards the Hawaiian Islands, currently has sustained maximum winds near 75 mph. A slew of dangerous storms – hurricanes, tropical storms and a typhoon — are on the move and threatening life and property in both the Atlantic and Pacific oceans. 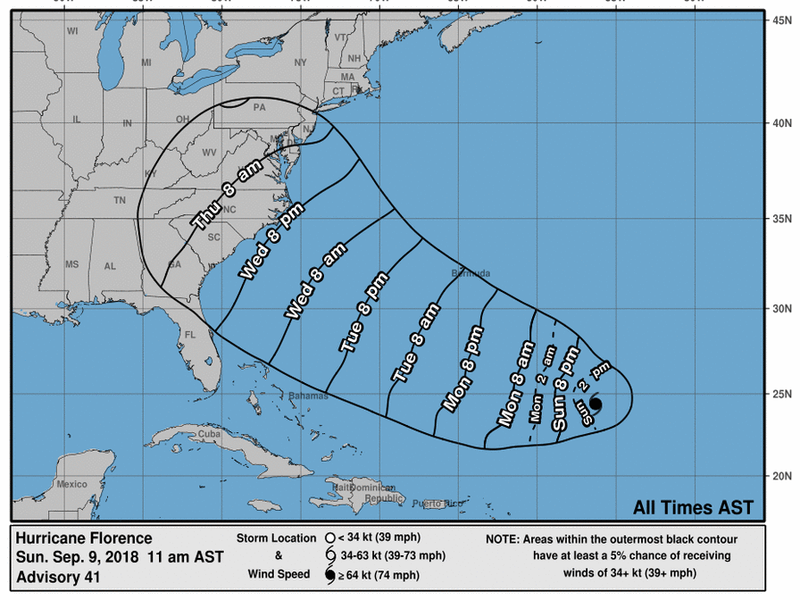 The National Hurricane Center has issued advisories for the Atlantic on Hurricane Florence, and two tropical storms, Helene and Isaac. The NHC has also issued an advisory for the Eastern Pacific on Tropical Storm Paul, and the Central Pacific Hurricane Center has issued advisories for Hurricane Olivia, which is moving quickly westward toward Hawaii. According to The Weather Channel, a typhoon named Mangkhut is also intensifying in the western Pacific and is on track to hit Guam, Rota, Saipan and Tinian on Monday. The National Weather Service has issued a warning saying Mangkhut will bring tropical storm force winds between 65 and 100 knots. This many concurrent tropical cyclones is notable, according to NHC scientist Eric Blake. He tweeted on Friday: "Globally, this is a remarkable day. I can't find another example of a hurricane/typhoon nearing Guam, Hawaii & the eastern United States at almost exactly the same time (days ~ 4,5,6 respectively)." 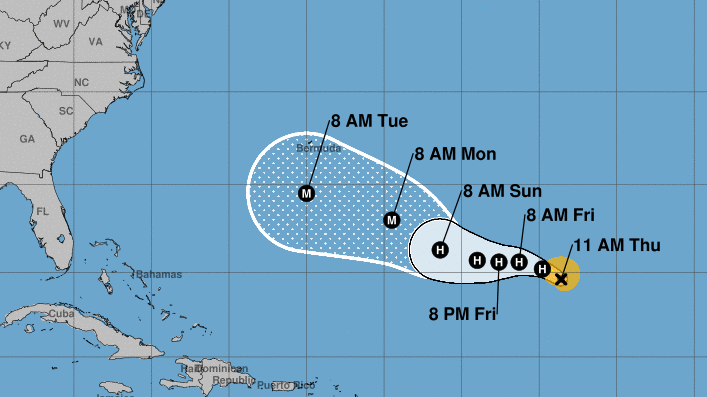 As of the NHC's advisory issued at 11 p.m. EST Sunday, Hurricane Florence is expected to strengthen to a major hurricane of Category 3 or above by Monday night and is forecast to move over the Atlantic Ocean between Bermuda and the Bahamas on Tuesday and Wednesday. It is expected to approach the southeastern U.S. coast on Thursday. According to aircraft data, its maximum sustained winds have increased to near 90 mph. North Carolina declared a state of emergency on Friday. North Carolina Highway Patrol Sgt. Chris Knox told NPR that North Carolina residents needed to prepare: "When we put those orders out, when we tell people 'this is a flood-prone area,' that you need to find somewhere else to go, don't roll the dice." Virginia Gov. Ralph Northam declared a state of emergency on Saturday, "... so that we can begin to prepare state assets, and I encourage Virginians to monitor forecasts and make their own preparations now." South Carolina Gov. Henry McMaster also declared a state of emergency on Saturday, and South Carolina's Emergency Management Division urged South Carolina residents to begin preparing their property for Florence's effects. In a news conference Sunday, McMaster said he had submitted a request to President Trump that a federal emergency declaration be made. "We are asking for authorization in advance to ... get reimbursed for expenses, for people, machinery and assets we may need to clean up and fix whatever damage results from what is now a hurricane." And while he assured South Carolinians that official preparations were well underway, the governor emphasized what he called the "unofficial" part of preparations: citizen preparedness. "Make your plans now," he said. "Pretend, assume, presume that a major hurricane is going to hit right smack dab in the middle of South Carolina." Dr. Rick Knabb, hurricane expert at The Weather Channel, tells NPR that it's important not to focus exclusively on the coast when it comes to Florence's potential impact. "Equally, if not more disastrous potential exists with the slow movement that we expect to see Florence have after reaching the coast," Knabb says. That's because Florence will reach areas that have already experienced a lot of rain in recent weeks — and it won't take much for flash floods to start in these regions. "Urge people to pay attention inland and promise themselves now that they're not going to drive their car across any water-covered roads or drive their car around any barricaded roads that are closed," Knabb says. "The majority of inland flood fatalities occur in vehicles." Helene, currently classified as a tropical storm, is, according to the latest NHS advisory, expected to become a hurricane soon as well. As a result, a Hurricane Watch and Tropical Storm Warning are in effect for the Cabo Verde islands of Santiago, Fogo and Brava. Tropical Storm Isaac is also strengthening over the eastern tropical Atlantic and is expected to become a hurricane by late Sunday. 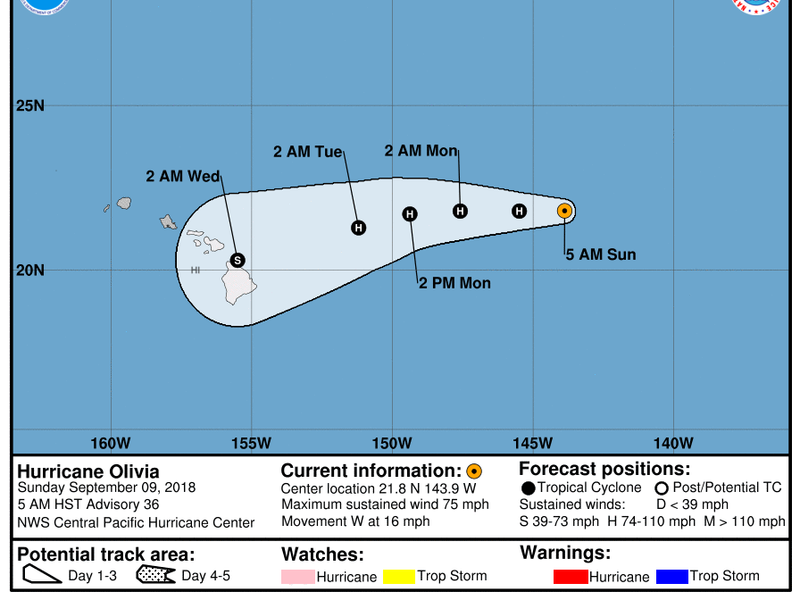 Hurricane Olivia, according to the Central Pacific Hurricane Center's advisory issued at 11 p.m. ET Sunday, is approaching Hawaii with maximum sustained winds of near 80 mph and is expected to remain at hurricane strength through Monday evening. "Some gradual weakening is possible on Tuesday," the advisory says, "but Olivia will likely remain a threat to the Hawaiian Islands next week." This news about Hurricane Olivia comes just weeks after Hurricane Lane brought 3-4 feet of rainfall to parts of Hawaii. As NPR's Bill Chappell reported, the town of Mountain View on the Big Island recorded 51.53 inches of rain as a result of Lane, the third-highest total ever measured from a U.S. storm. Knabb tells NPR that this year has been particularly intense in the eastern and central Pacific. "We've already had multiple very intense hurricanes out in the central pacific by Hawaii," he says. "We're well into the alphabet. The 'p' storm has already formed in the eastern Pacific, and we have a couple months left in the season." When a hurricane forms and begins to tumble landward, the one question anyone ever wants answered is: What's that mean for me, my family and my roof? While not absolute — it's weather after all — super computers and super graphics now allow meteorologists to provide a reasonable answer.